Recently my husband Greg and I got to spend a day in Hamilton. For a variety of reasons, we haven’t travelled a lot in the past few years, so a trip – even just as far as Hamilton, even if we had to take a stinky Greyhound, and even if the main purpose was for a beer festival – was still a trip. And if I could bargain a visit to the lovely Quatrefoil Restaurant in nearby Dundas out of the deal in exchange for sitting around at a beer festival for hours, all the better. Incidentally, the Because Beer Festival at Pier 4 Park in Hamilton, overlooking the lovely Hamilton Harbour, was delightful. Okay, I mostly sat at a picnic table by the water watching boats and geese while Greg drank and schmoozed, but it was well organized and relaxing. We arrived in Hamilton around lunchtime, rolled through the gorgeous original art deco bus station and headed to Brux House, a craft beer restaurant in the Locke Street shopping district, which is incidentally also owned by the folks who own Quatrefoil. Chef Fraser Macfarlane heads the kitchen in both locations, joined by chef Georgina Mitropoulos at Quatrefoil. Both places share a similar aesthetic – set up in old houses, with a subdued glamour, and attentive servers; Brux House is slightly more relaxed and laid back, Quatrefoil is pretty and elegant and they fold your napkin while you’re in the loo. 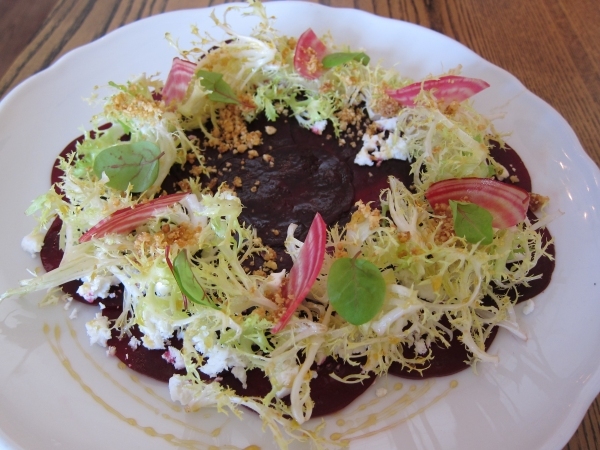 Above: Brux House – Beet Carpaccio with Shepard’s feta, hazelnut brittle, burnt honey. I’d eat beets more often if they came looking like a birthday cake. Note – At Quatrefoil we each had the Friday night 5-course tasting menu with the addition of the venison. 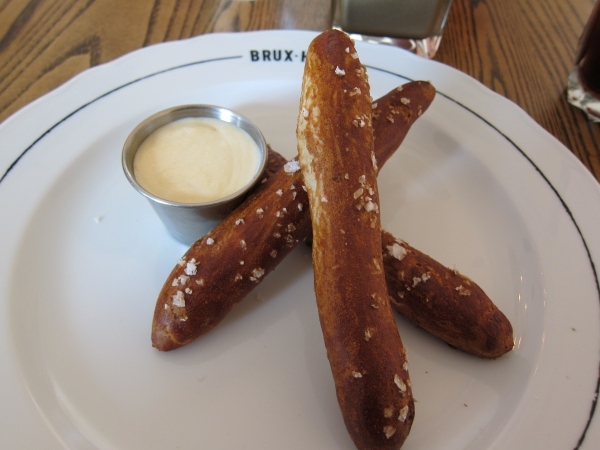 Brux House – soft pretzel sticks with Emmenthal and beer fondue. 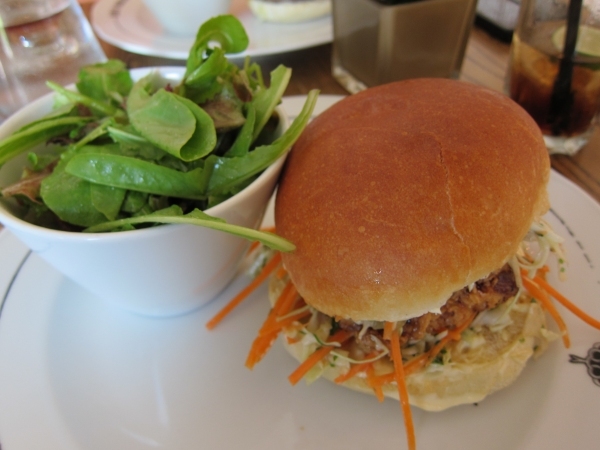 Brux House – country fried chicken sandwich with pickle slaw, Tabasco mayonnaise and greens. 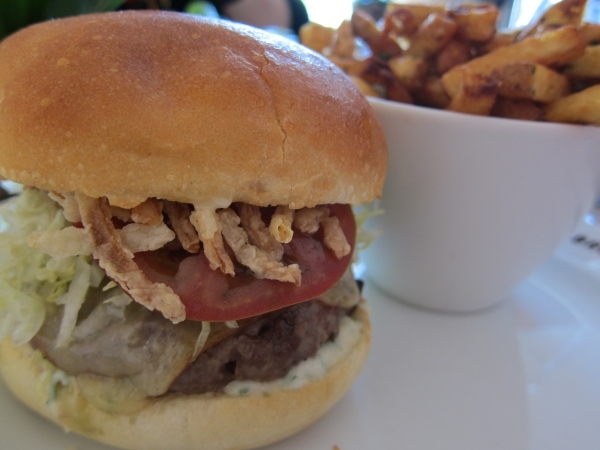 Brux House – burger – yes those are fried onions. 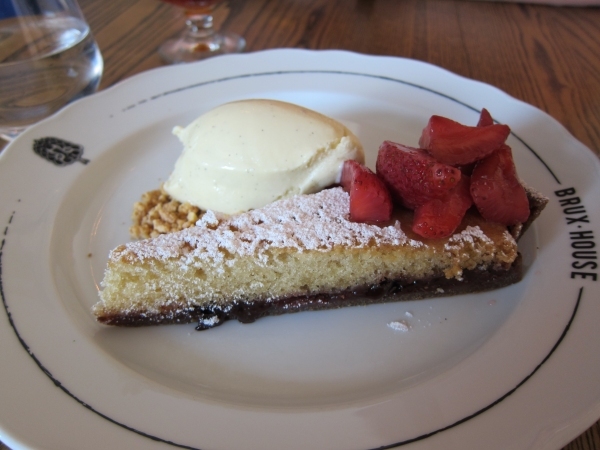 Brux House – chocolate bakewell tart – marinated strawberries, spent grain crust caramelized white chocolate, vanilla ice cream. 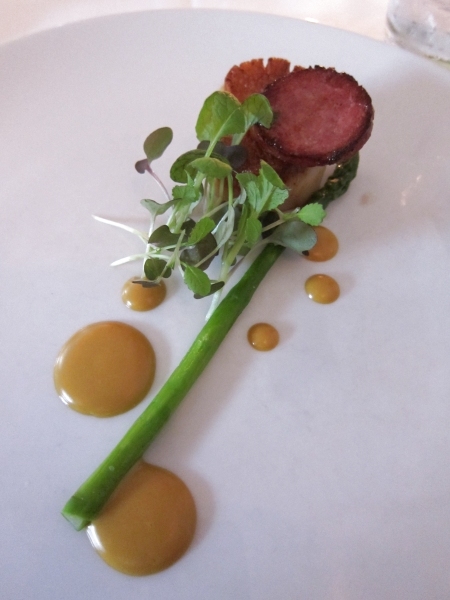 Quatrefoil – seared sea scallop with green asparagus, summer sausage, mustard leaf, miso mustard emulsion. 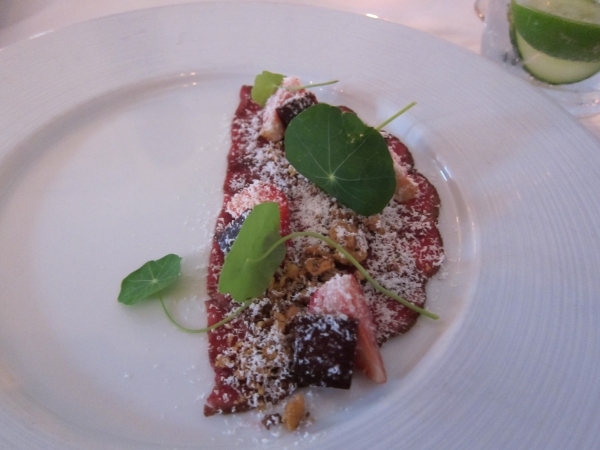 Quatrefoil – seared venison carpaccio with strawberry, nasturtium, port turnips, goat curd, and walnut crumble. We shared an order, thus the presentation. Brilliant dish – LOVED the berries with the venison. 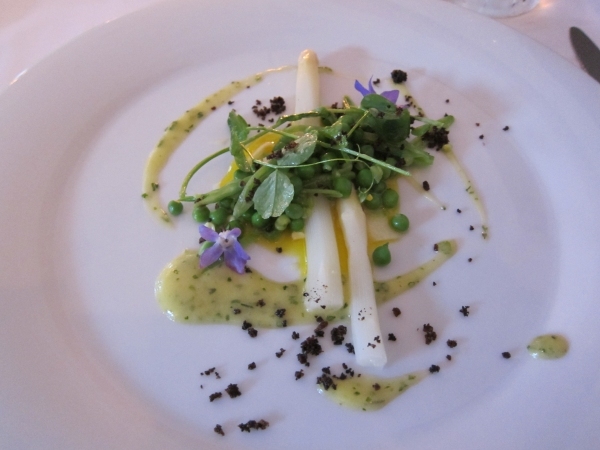 Quatrefoil – Ontario white asparagus with slow poached hen yolk, spring pea salad, burnt leek, potato crumb, and fines herbs vinaigrette. 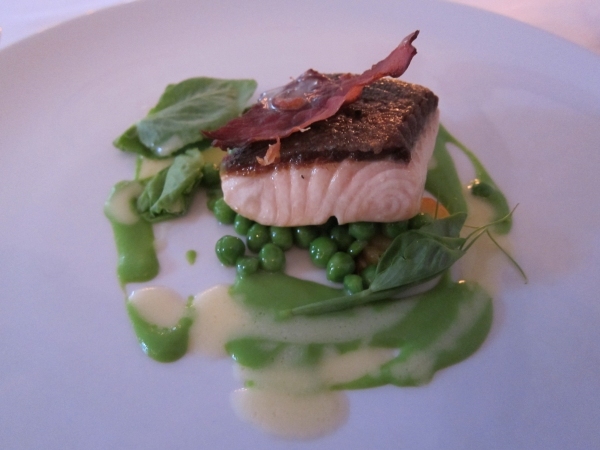 Quatrefoil – Spring salmon with heirloom carrot, peas, country ham, black garlic, charred potato, pea nage. 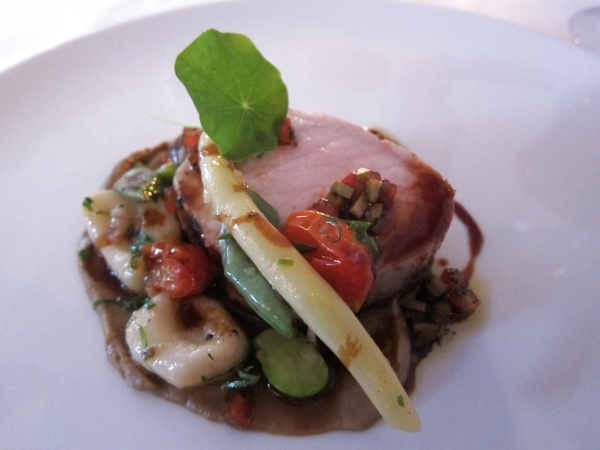 Quatrefoil – Willowgrove Hill pork loin with shelling beans, smoked aubergine, dried tomato, potato gnocchi, green olive sauce vierge. This was the only dish that didn’t totally rock us – the strong flavours of the veg seemed to overwhelm the sweetness of pork. Would have loved it with chicken or as a vegetarian dish with maybe a portobello. 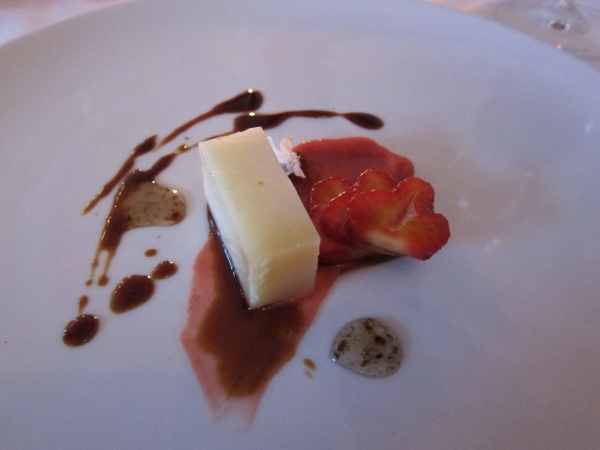 Quatrefoil – but if you send back half of a course because you didn’t love it, they send you cheese to make up for it. With preserves and truffle honey. 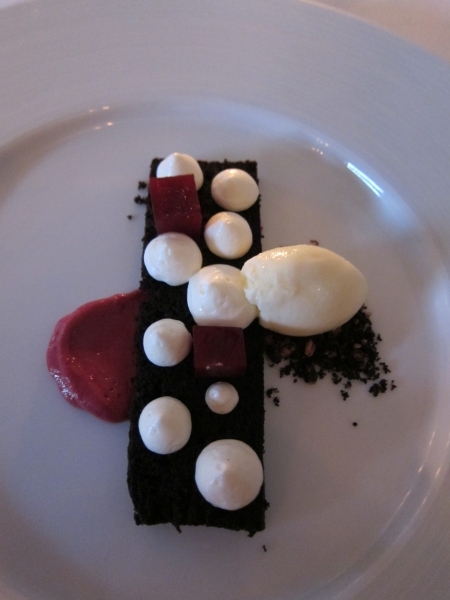 Quatrefoil – red velvet cake made with beets, topped with candied beet, cream cheese mousse, walnut, and white chocolate sorbet. So pretty – this looks like a piece of jewellery. And what irony that my beets at lunch looked like a cake while my beets at dinner were in the cake.